My boyfriend, Adam and I are healthy eaters, and have started cooking at home a lot. Let’s be honest, I cook and he buzzes around the kitchen looking for things I’ve chopped up to snack on. 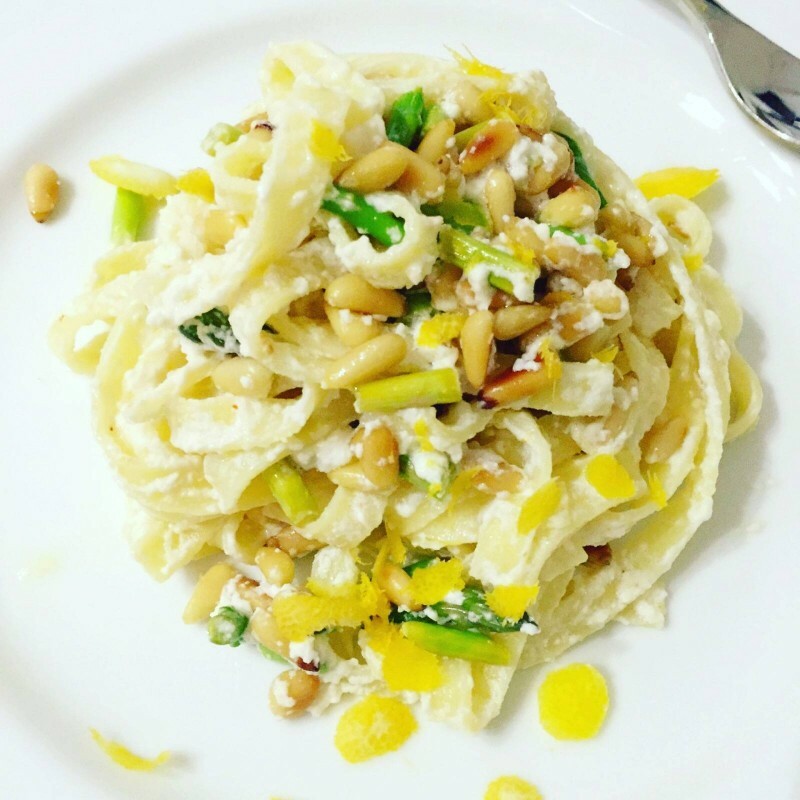 I recently made him this pasta with ricotta, asparagus, lemon zest and pine nuts. It’s super easy to make and very savory. Adam loved it so much he made me make it 2 days in a row and tried to get me to make it a third day. If you don’t like asparagus you can substitute peas, or spinach. Also, if you can’t find pine nuts you can substitute walnuts. Preheat oven to 350 degrees. Spread pine nuts on a rimmed baking sheet; toast in oven, tossing occasionally, until golden, 6 to 8 minutes; set aside. Or what I do is I put the pine nuts in a pan without oil and toast the pine nuts on the pan for a few mins until they turn golden and then set them aside. Meanwhile, bring a large pot of salted water to a boil. Add pasta, and cook according to manufacturer’s directions. I chop the asparagus and then cook them in the pan with a little bit of water for a few mins so that they stay bright green and then set them aside. Add oil and lemon juice; season generously with salt and pepper. Toss well. Serve immediately, topped with ricotta, pine nuts, lemon zest and Parmesan. If you like it super lemony you can squeeze extra lemon juice on it before serving. This looks so delicious, I will try to make it. Yummmy this sounds delicious. I love pasta recipes. This looks delicious. I am a carb pasta girl! Will make this this weekend!